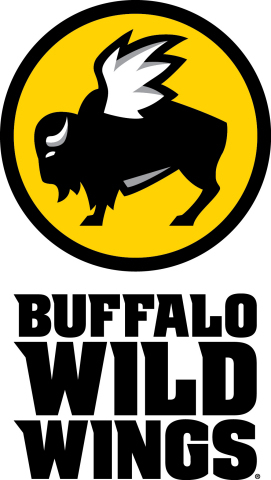 MINNEAPOLIS--(BUSINESS WIRE)--Buffalo Wild Wings, Inc. (NASDAQ:BWLD), in response to a press release issued by Marcato Capital Management, L.P. (“Marcato”) on May 22, 2017, today issued a presentation identifying Marcato’s continued inaccurate and misleading statements. The presentation is available at http://www.buffalowildwings.com/en/2017-annual-meeting/ and will be filed with the Securities and Exchange Commission (“SEC”). 1. If Marcato is right about a massive refranchising plan, why has it not even attempted to justify its assumptions and methodology? 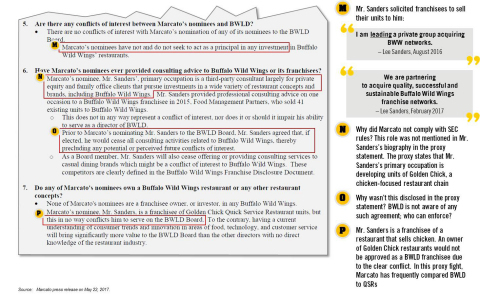 Buffalo Wild Wings has identified and publicly disclosed several important analytical errors or aggressive assumptions in the cornerstone of Marcato’s plan for Buffalo Wild Wings. Marcato has now put out a response to Buffalo Wild Wings’ 93-page presentation, but has not responded to the company’s detailed critique of Marcato’s refranchising related assumptions and modeling. 2. Other than the unprecedented refranchising plan, what concrete operating suggestions do the Marcato nominees have for improving the business? Marcato claims its slate of nominees are experts in casual dining and, even, in Buffalo Wild Wings’ business. 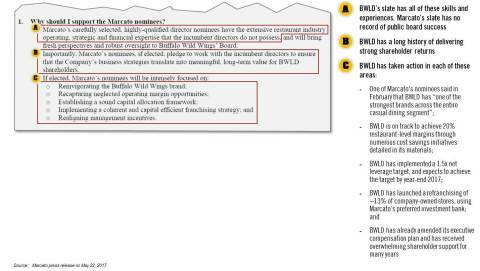 Yet, Marcato has offered no operational suggestions for how to improve the business. 3. How did the company perform so well for shareholders, and outperform its peers, with a Board that Marcato believes is inadequate? Buffalo Wild Wings has generated returns for shareholders of 24% per year, compounded, since its 2003 IPO. Yet, Marcato claims that the incumbent directors, who sat on the Board of Directors for some or all of this time, lack any relevant skills. 4. Why did Marcato purchase puts on nearly its entire investment in Buffalo Wild Wings – thereby eliminating its downside – the same day that Buffalo Wild Wings first publicly disclosed the significant analytical errors in Marcato's refranchising proposal? Buffalo Wild Wings had previously discussed these errors with Marcato and Marcato has still not corrected them or justified its erroneous assumptions. 5. Given Mr. McGuire’s weak performance in the boardroom, why should shareholders believe Mr. McGuire can create value for them at Buffalo Wild Wings? During Mick McGuire’s one-year term on the Board of NCR, no value was created for shareholders. Then, Mr. McGuire sold his stock. During Mr. McGuire’s directorship at Borders Group – including when he was Chairman of the Board – the stock declined precipitously, and the company eventually filed for bankruptcy. 6. Has Mr. Sanders continued his pattern of misrepresenting his career and prior actions? Emil Lee Sanders claims in his biography to have achieved successes while working at Buffalo Wild Wings that are objectively and demonstrably false. Marcato has not corrected the errors. Mr. Sanders also sent emails and texts in which he represented that he was a principal interested in buying Buffalo Wild Wings restaurant units from franchisees as recently as February 2017, after he was nominated to the Board of the company by Marcato. 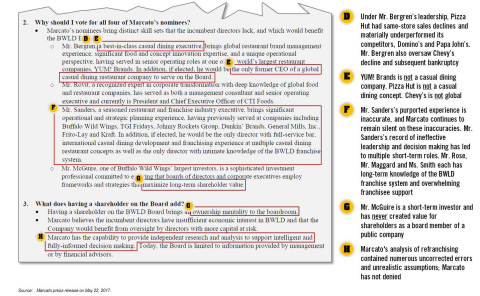 In its recent FAQs, Marcato claims Mr. Sanders was not trying to buy units himself, but was merely working as a consultant for others and that his efforts ceased in 2015. The letters and texts indicate otherwise. 7. What about Mr. Bergren’s career performance should give Buffalo Wild Wings shareholders comfort that he will add value to the Buffalo Wild Wings Board? Marcato’s nominee Scott Bergren was CEO of Pizza Hut US when it materially underperformed its competitors. Mr. Bergren’s boss, the CEO of Yum! Brands, specifically called out Pizza Hut’s underperformance on public conference calls. Subsequently, Mr. Bergren served as CEO of Pizza Hut Global for just one year before retiring. Yum! Brands then announced a major restructuring and turnaround of the business. 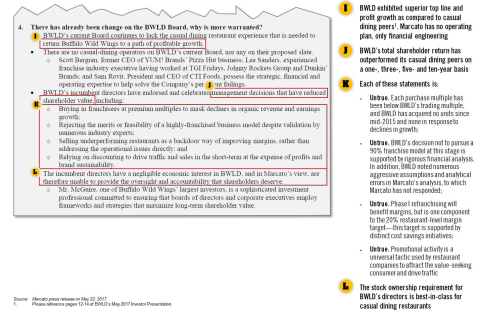 Buffalo Wild Wings recommends that shareholders vote the YELLOW proxy card “FOR” the election of all nine of the Board’s experienced and highly qualified director nominees: Cynthia L. Davis, Andre J. Fernandez, Janice L. Fields, Harry A. Lawton, J. Oliver Maggard, Jerry R. Rose, Sam B. Rovit, Harmit J. Singh and Sally J. Smith.